Seeing a Fallstreak cloud is a amazing sight cause not a lot of them happen on a daily basis. 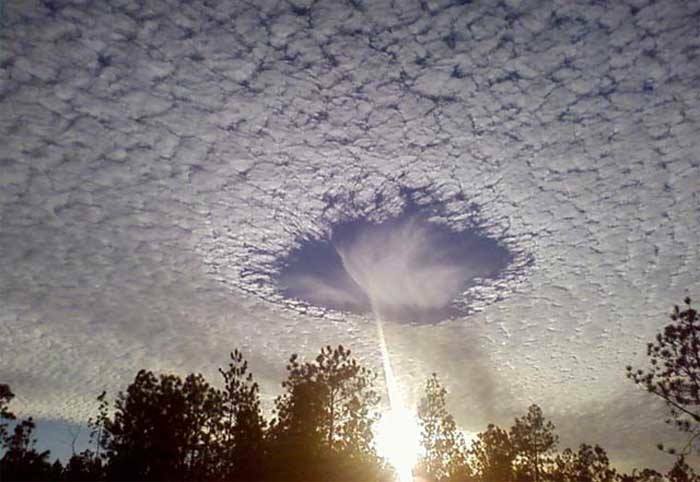 Fallstreak Clouds (can also be called Punch Hole Clouds) form when your mid-level clouds (like a altocumulus and are composed of tiny water droplets) are supercooled. They need to be able to freeze into ice crystals and needs something to freeze them. This usually happens when planes fly through these supercooled water droplets and turn them into ice crystals. Once they are turned into ice crystals, they will grow and then fall. 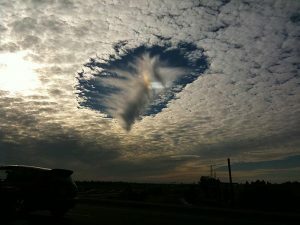 The hole in the cloud is where the ice crystals have fallen and the hole gets bigger when ice crystals around them are repeating the same cycle.